Romancing Olive: Prairie Romance by Holly Bush for sale on Audible! 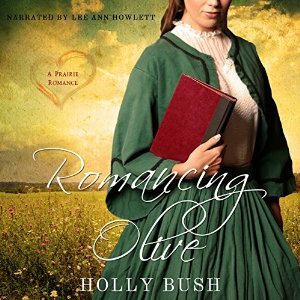 Lee Ann is pleased to announce her latest production, Romancing Olive: Prairie Romance by Holly Bush, is now available on Audible. 1891… Spinster librarian Olive Wilkins is shocked to learn of her brother’s violent death at a saloon gaming table and her sister-in-law’s subsequent murder, traveling far from her staid life to rescue her niece and nephew, now orphans. She arrives to find the circumstances of her brother’s life deplorable and her long held beliefs of family and tradition, shaken. Accustomed to the sophistication of Philadelphia, Olive arrives in Spencer, Ohio, a rough and tumble world she is not familiar with, facing two traumatized children. Her niece and nephew, Mary and John, have been living with a neighboring farmer, widower Jacob Butler, the father of three young children of his own and a man still in pain from the recent loss of his wife. Real danger threatens Olive and Mary and John, while Jacob and his own brood battle the day-to-day struggles for survival. Will Olive and Jacob find the strength to fight their battles alone or together? Will love conquer the bitterness of loss and broken dreams? Listen to a sample and/or purchase Romancing Olive here. Posted by lahowlett on March 29, 2015 in Uncategorized.